I returned last night from a 24-hour whirl to Sioux Falls, South Dakota. Sioux Falls is the kind of America's heartland I had never much expected to find myself, but when your nephew marries the daughter of a windmill farmer it's also pretty much where you end up when you attend his wedding. Exactly one week earlier I had been in Los Angeles, at the IMATS (international Makeup Artists Trade Show) and I had been feeling the conflict of commerce versus cause (see prior blog post). At that show, I rode the rapids of thousands of young Californian women clamouring for discounted color cosmetics and their accouterments. Here in South Dakota, on my way to the early morning farmer's market to grab a coffee before the wedding, I was standing near the natural water rapids which give Sioux Falls its name. A dynamic water way which has been running in this same location for more than 10,000 years, before their was an American heartland, before the Lakota camped at its shores, when it was just nature and nature, cascading over shiny stone. My whole family swarmed the small farmer's market, buying up fair trade coffee and sampling organic radishes with sea salt. Of course, there was a local soap maker as well, and I was pleasantly surprised to see that she had expanded into mineral makeup and was a customer of mine. 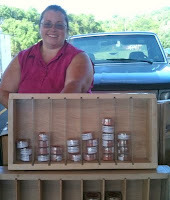 Meet Rebecca of Pearl Creek Goat Milk Soap (pearlcreekgoatmilksoap.com). I overheard Rebecca talking to my sister-in-law about her Breast Cancer Awareness lip gloss which was part of her mineral makeup line and of course I made a beeline to her booth to hear more! Rebecca told me about her husband's grandmother, Barbara Turner, who had given to worthy causes all her life and in particular had supported the organization Susan G. Komen for the Cure. Barbara Turner had passed away after battling breast cancer not too long ago, and when she did, she made Rebecca promise that there would always be something in her product line which would be dedicated to raising money for worthy causes. "Even if it isn't a lot of money, it's something", Rebecca explained. The wedding was lovely, the champagne flowed. I returned to California the next morning, with a precious Barbara Turner lip gloss tucked in my pocket. It was July 4th, America's day of independence. Each time I reached for a boarding pass or a check of the clock, I touched my lip gloss. Each time I took a moment to be proud that I was so truly American: buttons, banners, ribbons and all.